Lovely rug! It is plush, you can't feel the backing on it when you walk like some cheaper rugs out there. A really nice mixture of both thick fibers and thinner fibers with a bit of luster. I find the pile height to be perfect, I always think less looks cheap when it comes to shag rugs but more would appear messy. This one is perfect. Its a nice cream colour, I would not call it too white, too tan or too yellow. 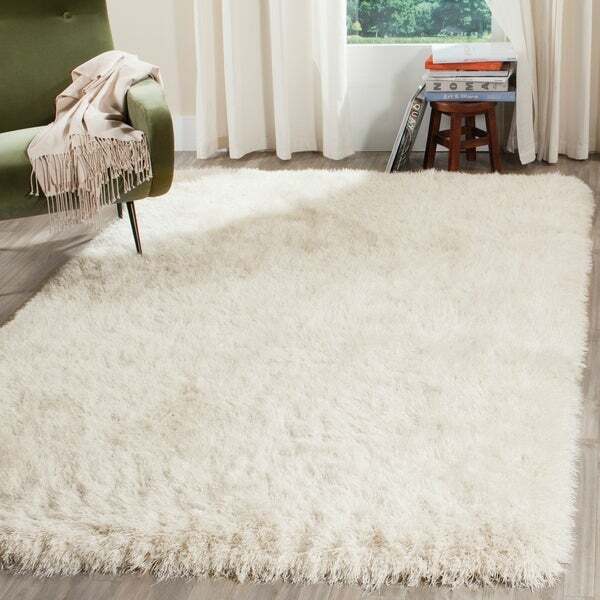 I will admit, I sent back 4 rugs (from Wayfair and other) prior to settling on this one... So I am very picky! I also really appreciate the packaging it arrived in- thank you Overstock for protecting it well for shipping! Absolutely love this rug. It's thick and soft and perfect for our family room. I was so nervous to order a rug online, but it is just what I wanted! Beautiful color and looks just like the photos show! It is so soft and lovely! Very pleased! This rug is soooo soft. The pile is fluffy and great. I put this in my master bedroom and it works very well with the oatmeal colored furniture. I would buy this in other colors if the6 have it. Lays flat, no shedding, soft underfoot. What more could you ask for? My 8 year old LOVES it. Arrived quickly, and was easy to lay out. It is super silky and is a nice weight without being too heavy. Gorgeous rug. Looks just as amazing as it does in the photos! I'm so happy that I decided to go with this rug. It's also super soft and comfy. Really put the final touch on my living room! Excellent quality, beautiful color, love everything about it. Gorgeous, plush and wonderful quality. No odor and lays flat pretty quickly. More beautiful than pictured! 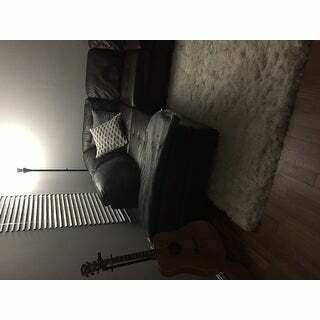 Its a very nice area rug..I would definitely recommend it! Soft, plush, and quality beyond expected. Really warmed up the room! This carpet is very plush and a beautiful addition to our bedroom. The carpet is very nicely constructed and looks much more expensive than it was. It was a great buy. So far I am thrilled with Overstock. Gorgeous rug!!! Very thick and luxurious. It completed the look of the room and was exactly what I wanted. Only a little shedding and seems duriable however, I would not recommend for high traffic areas. Be careful with this one! We bought this and initially loved it for its looks and softness. It sits partially under a sectional and there is a coffee table on top of it. Over a few months it started to get dirty, really dirty, where we were walking on it. We turned it around so the part under the sectional was in the living area and the difference was like black and white! I have called a pro to clean it and he said that he would do so at my own risk. Apparently these types of rugs are more for looking than walking on. The polyester attracts and holds dirt, not sure what I am going to do about it now. I just moved into new apartment with hardwood floors. 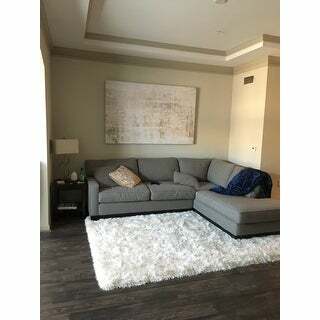 My dogs having difficulty walking on the floors, I wanted Area rug and runner that was contemporary, plush ivory shag because all my furniture is dark wood and hardwood floors are med/dark, the ivory contrast provides richness to the room and hall. "How do you recommend cleaning this rug?" I just got off the phone with a professional carpet cleaner and he said he would clean it "at my own risk" for $. Seems these types of rugs are just for looking and don't really function well with people walking on them. I have had mine less than a year and it is black in places from walking on it. We take our shoes off in the house and are very clean people. The polyester fibers attract and hold dirt as they are oily, according to the professional.